As Corey and Pauling refined their structures, word reached Pasadena that Courtaulds, a British chemical firm working on synthetic fibers, had come up with some interesting data. Researchers there had discovered a way to make synthetic polypeptide chains by stringing together a single type of amino acid (instead of the mix of amino acids found, for instance, in natural keratin). Pauling was especially interested in the fact that these pure Courtaulds chains, when x-rayed, showed no signs of the confounding 5.1 angstrom repeat that Astbury had found in all natural keratins. What did that mean? To Pauling, it strengthened the case that Astbury's 5.1 angstrom reflection was not, after all, an absolute requirement for all polypeptide chains. If it was not an absolute requirement, there was at least some support for he and Corey ignoring it. The Courtaulds synthetic fibers also appeared to be long-chain molecules that assumed a pencil-like shape (which could be explained by their being helixes), that were hydrogen-bonded along their length (as Pauling's models predicted). His belief in helixes strengthened, Pauling continued to expand his model-building, coming up with additional theoretical protein structures, and working with Corey to construct large-scale, space-filling versions of their helixes. The news began to circulate at Caltech that Pauling was onto something big. When he announced that he was going to give a seminar on protein structures he drew a large crowd of colleagues and students. "Everybody knew this was going to be pretty hot stuff," remembered one biology professor. Pauling made a show of it, entering the large lecture room flanked by assistants carrying a variety of props. One particularly interesting piece looked like a tall sculpture wrapped in cloth bound with a string. Pauling started his talk by describing the basics of protein structure, drawing illustrations of flat peptide bonds and hydrogen bonds on a chalkboard. He held up a child's set of soft plastic pop-beads and snapped them together to show how amino acids could connect end-to-end. 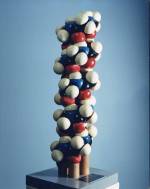 Still talking, he pulled a small jackknife from his pocket, opened it, and approached the wrapped sculpture, which everyone now realized was his finished model of a basic protein structure. Pauling seemed ready to reveal it, but then he backed off, continuing his talk, building suspense - a trick he pulled several times. Finally he cut the cord and revealed his masterpiece: A skein of red, white, and black atoms twisted into a thick, knurled column. It was the alpha helix. And it was stunning. Pauling and Corey had fashioned it not from the old ball-and-stick models that looked something like Tinker Toys, but in a new form that they helped design, a so-called space-filling model in which the atoms, each colored according to its element, fitted tightly next to each other. The result was a solid-looking structure in which the helix's essentials could be more easily grasped, almost felt, its length, depth, density, curve, and atomic relations clearly apparent. It was a triumphant unveiling. Pauling ended his talk with evidence that his helical structures might exist in a variety of natural proteins. Afterward he was surrounded by admirers. The show was a sensation. Space-filling model of the alpha-helix. 1951. 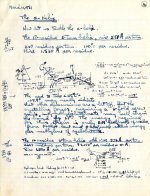 Notes re: the α-Helix, March 11, 1951. "When I saw the alpha-helix and saw what a beautiful, elegant structure it was, I was thunderstruck and was furious with myself for not having built this, but on the other hand, I wondered, was it really right? ... I realized that I had a horse hair in a drawer. I set it up on the X-ray camera and gave it a two hour exposure, then took the film to the dark room with my heart in my mouth, wondering what it showed, and when I developed it, there was the 1.5 angstrom reflection which I had predicted and which excluded all structures other than the alpha-helix. So on Monday morning I stormed...into Bragg's office and showed him this, and Bragg said, 'Whatever made you think of that?' And I said, 'Because I was so furious with myself for having missed that beautiful structure.' To which Bragg replied coldly, 'I wish I had made you angry earlier.'"